Kelp Queen Press, 9781771484015, 120pp. 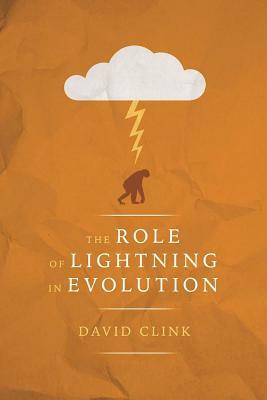 The Role of Lightning in Evolution is the fifth book of poetry from Aurora Award winner David Clink, and his first book-length collection of speculative poetry since 2010's Monster. This is speculative poetry at its best. Found in these pages are award winners and finalists: "A Sea Monster Tells His Story," "The Perfect Library," "A City of Buried Rivers," and "The Machine." Every poem goes beyond monsters and time travel and post-apocalyptic visions. There is heart here, a love of family (no matter how strange that family may be), ghosts, a seance, shapeshifters, a dragon made of words, an insect caught between dimensions, and a road that can feel your every footfall. Every poem is a journey beyond, a slice of another reality that lets us see our own existence in a different way. David Clink is the former Board President and Artistic Director of the Rowers Pub Reading Series, and former Artistic Director of the Art Bar Poetry Series. David has written over 500 poems, and his poetry has appeared in over 50 journals including Analog Science Fiction and Fact (4 times), The Antigonish Review (2 times), Asimov's Science Fiction (2 times), Cicada, CV2: Contemporary Verse 2, The Dalhousie Review (4 times), Descant, echolocation, Existere: Journal of Arts and Literature (5 times), The Fiddlehead, Grain Magazine, The Literary Review of Canada (5 times), Matrix Magazine, On Spec: The Canadian Magazine of the Fantastic (2 times), The Prairie Journal of Canadian Literature (2 times), Prism International, The Toronto Quarterly, and in over ten anthologies, including Tesseracts 14 and Tesseracts 16, and, Imaginarium 2012: The Best Canadian Speculative Writing, and, Imaginarium 2013. He has a poem in Guernica's Poet to Poet Anthology, and their I Found It At The Movies anthology. He has poems forthcoming in The Antigonish Review, On Spec, and Asimov's Science Fiction, and the anthology Tesseracts 18: Wrestling With Gods: Faith in Science Fiction and Fantasy. He is a member of four writing groups. He was co-publisher, along with Myna Wallin, of Believe Your Own Press, which published twenty quality chapbooks in its five-year history. His poem "A sea monster tells his story" won the 2013 Aurora Award for Best Poem/Song, and was also nominated for a Rhysling Award. His poem "Falling" was nominated for two awards: the Rhysling Award and the Aurora Award. His poem "Copyright Notice 2525" placed second in the 2007 Asimov's Reader's Poll. David co-organizes, along with Sandra Kasturi, a one-day poetry workshop, entitled "A Fistful of Poems" which has been run 7 times. He has two collections of poetry published by Tightrope Books: Eating Fruit Out of Season (2008) and Monster (2010). He edited an anthology of environmental poetry called: A Verdant Green (The Battered Silicon Dispatch Box, 2010). His third collection, Crouching Yak, Hidden Emu, a book of humorous poems, was published by The Battered Silicon Dispatch Box in October 2012.